Sumner Richman took care of his wife, Joyce, in their apartment in North Oaks, Minn.
CAMBRIDGE, Minn. — Sheriff Chris Caulk was frightened. He couldn’t see, at least not well enough to read or orient himself, and his feet ached from the popcorn kernels rattling around inside his socks. The oven mitts on his hands made it hard for him to grasp anything. Caulk, who patrols in rural Isanti County, Minn., was experiencing something of what it is like to be elderly and suffer from dementia — and he was taken aback by how vulnerable he felt. Minnesota supports similar training for everyone from waitresses to bank tellers to accountants in an aggressive effort to create dozens of “dementia-friendly” communities across the state. In the coming year, similar programs will roll out nationwide as part of a major initiative, Dementia Friendly America, touted by the White House at this summer’s Conference on Aging. Nineteen regions, ranging from the city of Denver to the entire state of West Virginia, have committed local resources. Massachusetts communities such as Brookline and Mashpee are joining the movement as well. The goal: to support the 5.3 million Americans who have Alzheimer’s — and to help communities prepare for the 16 million expected to have the disease by 2050. Supporters compare the movement to the push 25 years ago to build ramps and other accommodations for the physically disabled. In Brookline, the police department offers tracking bracelets for individuals with dementia who are prone to wander. The community’s first “memory cafes” also opened this year; they’re basically support groups for caregivers, meeting monthly over coffee. But the goal of preparing the country for the surge in dementia faces hurdles. For one thing, police training that works in a small community isn’t necessarily applicable to a major city, where law enforcement officers have more on their plates and might not know the citizens they serve as well as do officers in a rural town. When it comes to big, urban areas, it’s not clear training the police will make them “any more warm and fuzzy” when dealing with erratic or confused residents with dementia, said Dr. Deborah Blacker, a geriatric psychiatrist at Harvard. Another problem: The federal Centers for Disease Control and Prevention estimates that only 40 percent of people with Alzheimer’s have been diagnosed with the disease. It’s a challenge to design a support network for a community that largely isn’t aware it exists. In Minnesota, 34 communities signed on after the state Legislature passed a bill in 2013 funding the programs. Each got $18,000 to test interventions. While some considered infrastructure changes like better signage and transportation for the elderly, most focused on teaching volunteers how to relate to patients with dementia. Civic leaders from as far as Texas came to take part in the training. In some communities, those interventions are starting to pay dividends. Take the police officer from outside Dallas who stopped in for a soda at a gas station. The cashier pointed out an elderly woman with dementia who’d become disoriented when a roadblock took her on a detour. She knew she was going to church, and that she’d come from a busy road, but nothing more. The off-duty officer, who had gone through dementia training in Minnesota, knew to ask politely for her driver’s license. From her home address and where she’d ended up, he figured out what church she was going to and helped her on her way. Volunteers in every sector of a local economy pick up similar tricks through training. Servers at restaurants, for instance, learn common signs of dementia, such as using incorrect words or becoming easily agitated. They’re then trained to respond in a calm, friendly way. They are taught not to take sudden changes in mood personally if a customer has dementia. Bank tellers, meanwhile, learn to politely ask elderly patrons for an emergency contact, so that if they try to withdraw a large sum of money or become disoriented over the checkbook, the teller has someone to notify. The communities in the program — which have received funding from sponsors such as the Alzheimer’s Association, AARP, CVS Caremark, and the National League of Cities — also seek to support those who care for memory-impaired relatives around the clock. “There are people who can’t go outside to mow the lawn, even go take a shower, because they can’t leave their sick spouses or loved ones alone,” said Kirsten Kennedy, mayor of North Branch, Minn.
Fifteen miles away in the small town of Cambridge, ACT on Alzheimer’s volunteers connected Cheryl Anderson, who looks after her 94-year-old mother, with a monthly support group. Members have loved ones at various stages of the disease, so they’re able to swap information about the progression of Alzheimer’s and share tips from experience. 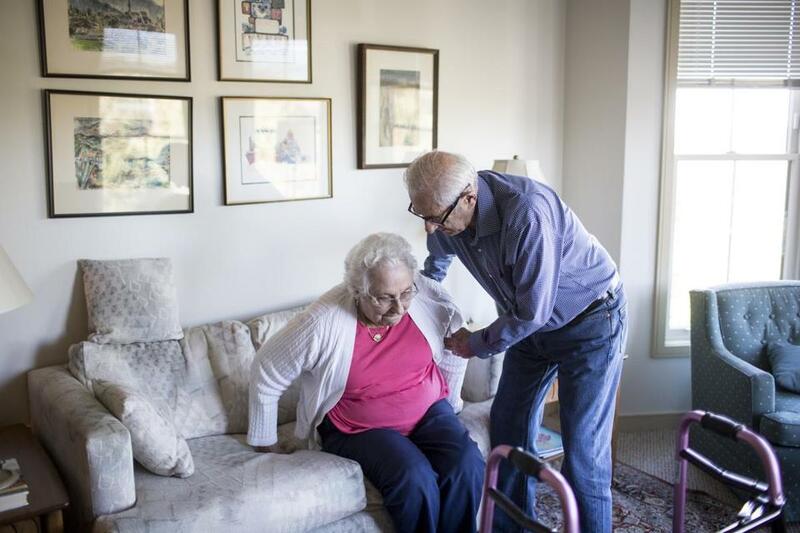 “As a caregiver, everything is a first,” Anderson said, “and it kinda throws you a bit” — such as the first time her mother stored her dentures in a planter, or the first time she forgot her own mother had died. The support group was like a handbook for how to deal with those firsts. Anderson learned, for example, that when her mom brought up her own mother, it was more productive to steer her into sharing stories from her childhood instead of trying to explain the death for the umpteenth time. The dementia-friendly movement also aims to connect patients with appropriate care. 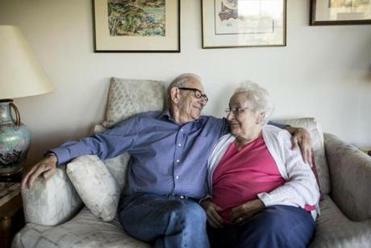 In St. Paul, a volunteer action team set up to work with the Jewish community helped Sumner Richman find an assisted-living facility where he could still live with his wife, Joyce, who has severe Alzheimer’s. Most facilities separate spouses when one needs a significant amount of care. Sumner Richman kisses his wife, Joyce, before bed every night, and she tells him she loves him. “I would never allow that,” Richman said. He kisses his wife before bed every night, and she tells him she loves him. It’s what they’ve done for 63 years, and he didn’t want to let her Alzheimer’s change that. Recognizing that many primary care doctors don’t have expertise to properly diagnose dementia, the action team in Cambridge brought an Alzheimer’s specialist to the local hospital to train clinicians. Volunteers in several towns also started offering memory screenings. Alzheimer’s disease crept up on Kathy Stack, who lives in a neighborhood in St. Paul that has embraced the dementia-friendly perspective. She started forgetting the names of students in the school where she’d long volunteered. She’d leave the house without her keys once a week, then twice, then four times. Two years into her diagnosis, at age 70, Stack knows how to deal with her memory loss. She starts every day with 45 minutes of cardio, then meditates, as recommended by her doctor. Then she checks her e-mail. She goes to a support group organized by her community, where people with Alzheimer’s make pottery and write poems. @statnews.com. Follow her on Twitter @meggophone. Follow STAT on Twitter @statnews.